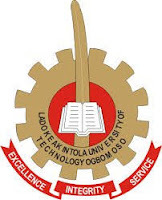 The management of the Ladoke Akintola University of Technology, Ogbomoso (LAUTECH), wishes to notify all students who were admitted during the 2016/2017 and 2017/2018 admission exercises that 2017/2018 matriculation ceremony has been scheduled to hold on Monday, February 19, 2018 in 1200 Lecture Theatre at 10.00am. Read Also: LAUTECH Orientation Exercise Schedule. To this end, all male matriculating students are to preferably put on black trousers and white long sleeve shirt with maroon colour tie while their female counterparts are advised to put on black skirt and white shirt with maroon colour neck scarf. Matriculants who cannot afford to appear in the prescribed dresses are eligible to be part of the ceremony .However, formal dressing will be a pre – condition to be part of the ceremony. LAUTECH Matriculation Academic Gowns Collection Procedure. The collection of academic gowns will take place at their various faculties on Friday, February 16, 2018. All students admitted during the 2016/2017 are expected to pay the sum of Five hundred Naira (#500.00)only to their Faculty Finance Officers for the purpose of collection of the gowns while candidates who were admitted during the 2017/2018 admission exercise are to present a copy of their offer of admission acceptance fee receipt and a copy of print out of their tuition fee payment for collection of the matriculation gowns at the Faculty Office.